The ANIC-200KFlex is a state-of-the-art, PCIe adapter/NIC designed for demanding network monitoring and security applications. 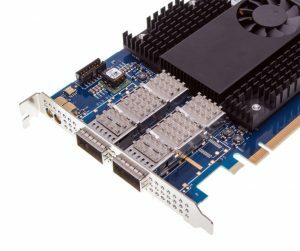 This FPGA-based adapter features dual QSFP28 (or QSFP+) interfaces that most often provide two 40G ports or two 100G ports and is designed for NEBS compliance. Ports can also be mixed and matched to support for example, one 40G and one 100G port on the same adapter. In addition, the architecture will also support 25G or 50G ports. It is for this reason we refer to this is a “flexible” or “flex” product. The ANIC-200KFlex comes complete with an array of packet processing features such as precise timestamping (4nS precision), packet merging, tunnel decapsulation, packet slicing, packet filtering, deduplication, packet steering, direct memory access (DMA), and more. For applications requiring full 200Gbps lossless data transfer across the PCIe bus into the host CPU (host packet buffers), two separate ANIC-200KFlex adapters can be interconnected via a direct attached cable (DAC). 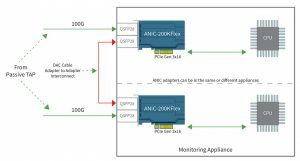 The DAC connection between the ANIC-200KFlex adapters enables an aggregate 200Gbps of received traffic to be load balanced between the cards and transferred across the PCIe bus for processing by the CPUs. The two ANIC adapters can be in the same physical appliance or in different appliances as illustrated in the following diagram. Flexible network interface of 40G or 100G; 25G and 50G interfaces are also supported.